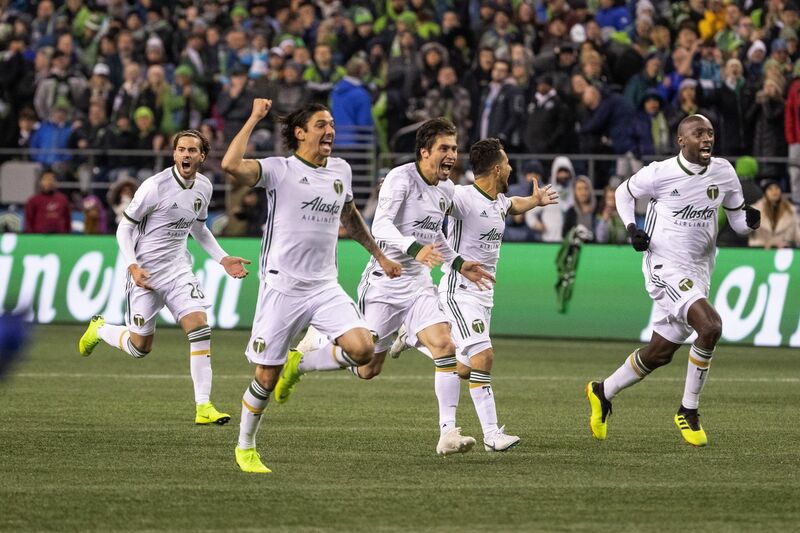 Lancaster native Zarek Valentin led the celebrations after the Portland Timbers beat the Seattle Sounders on penalty kicks to finish a wild playoff series between the longtime rivals. Seattle took a 1-0 lead in the match and pulled even at 2-2 on aggregate — with the road goal tiebreaker — when Ruidiaz scored in the 68th minute after Attinella mishandled a cross into the penalty area. Less than 10 minutes later, Blanco scored to put the Timbers ahead 3-2 on aggregate and even in the match at 1-all. Once the match reached extra time, road goals were no longer a tiebreaker and the rule proved to make a difference. Portland went ahead 4-3 on aggregate when Asprilla scored in the 93rd minute on a perfect cross from Valeri. That lead lasted all of four minutes after Blanco made his second major mistake late in the match, getting called for a clear handball in the penalty area. Nicolas Lodeiro confidently beat Attinella on the penalty kick and the sides were even at 4.